Jiaps, the journal of IAPS will have a new issue soon. It is nearly two years since the last issue of Jiaps was produced. But now is a new issue, prepared by a team of 3 motivated editors and half a dozen authors, finished. We should be able to present it here within the next weeks. 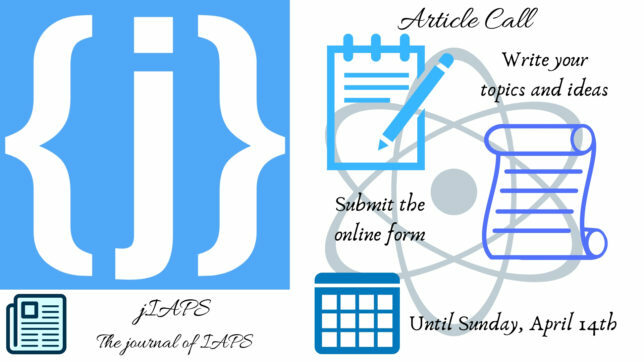 The journal of the International Association of Physics Students (jIAPS) is looking for articles for its new issue. The subject could be on any aspect of physics: anything from a straightforward report on a recent breakthrough in research, to recent advances in computer game physics engines, and everything in-between. Email us an article pitch. Chances are if it’s interesting and even tangentially connected to physics we would be happy to commission it. The deadline for suggesting a topic is the 1st of October, after which you would have a month to write the thing. For inspiration check out some of the back issues here or here.